Defects in casting reduce the performance of cast component and not desirable. Caster has to supply components as per quality specification from the customers. Using computer simulation of metal casting process, accurate prediction of the casting defects is possible. Figure above, left shows the prediction of shrinkage porosity using ADSTEFAN casting simulation software. Figure in right shows the defects in the physical casting produced in the plant. Figure above, left shows the prediction of shrinkage porosity defect in casting using ADSTEFAN casting simulation software. 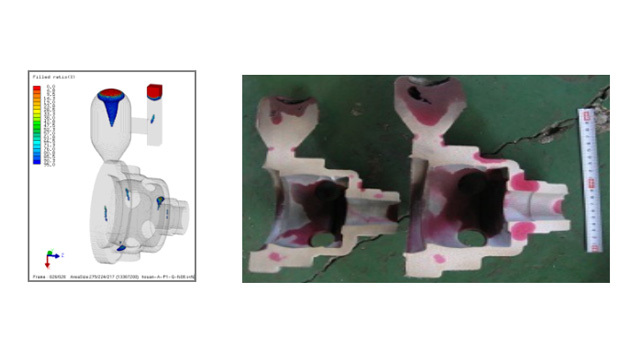 Figure in the right shows the defects in the physical casting produced in the plant. Figure above shows last region of air evacuation from the cavity during filling of the molten metal, using casting simulation software ADSTEFAN. Blue color region indicates the unfilled region in the mold (with air), grey color region indicates regions where molten metal is already filled, and mixture of colors indicates regions where there is a mixture of air and molten metal. Air might get entrapped in these highlighted region. Using this insight from casting simulation, designer can redesign to provide sufficient venting to avoid and overcome air entrapment simulation. Cold shut defect in casting occurs two the wave fronts of two metal streams meet, but does not fuse. This can happen when one of the wave front of melt has already lost its temperature and solidifies before molten metal fusing. Cold shut defect in casting occur at surface level with relatively large thickness, cold shut can be eliminated by increasing metal pouring temperature, preheat the die and mould. Improper casting properties to the alloy may also cause cold shuts. Proper optimization of the gating system, increase in pouring temperature can avoid cold shuts. Figure above shows the two fronts of casting about merge their streams by computer simulation of casting using ADSTEFAN. One of the streams has already cooled to temperatures much below liquidus. From simulation a high probability of cold shut formation has been predicted. 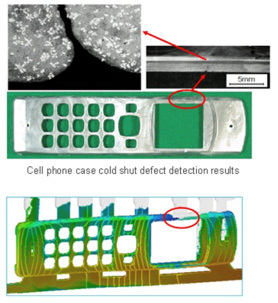 Figure above shows the cold shut defect formed in a cell phone casing cast in magnesium alloy. Figure shows the ADSTEFAN casting simulation and physical prototype produced and the micrograph. Hot tear defect in casting occurs predominantly due to tensile residual stresses that occur in casting during the cooling period. Embrittlement in castings enhance the hot tear formation. Using ADSTEFAN for casting simulation, designer can predict the extent of residual stresses induced in the casting and explore the probability of hot tear formation. 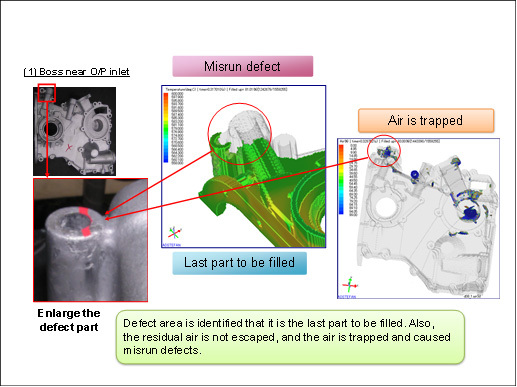 Mis run is a casting defect that occurs when the molten metal losses heat, and temperature has been reduced to such a level, it can not flow further to fill the mold cavity. Figure Above shows the misrun defect occurring in the cast component (left side), and formation of the misrun defect by casting simulation using ADSTEFAN. Figure above shows misrun defect predicted by ADSTEFAN simulations, and also regions off air entrapment defect. Figure compares the simulation results with plant trial castings. How Macro porosity (shrinkage defect) can be eliminated ? Riser dimensions modified to feed the shrinkage porosity volume shown in adstefan. Predict these defects. This will help the designer to eliminate the micro porosity by reducing the cooling rate. The image 2 & 3 shows the shrinkage present in the component. These shrinkages are due to lack of molten metal in the riser to feed the casting during solidification. The shrinkages are present all along the component surface as shown. Shrinkages present in red are of considerable volume.